The Ebac Kompact has been built with all the features and demands required by the cleaning, Fire and Flood restoration industry. 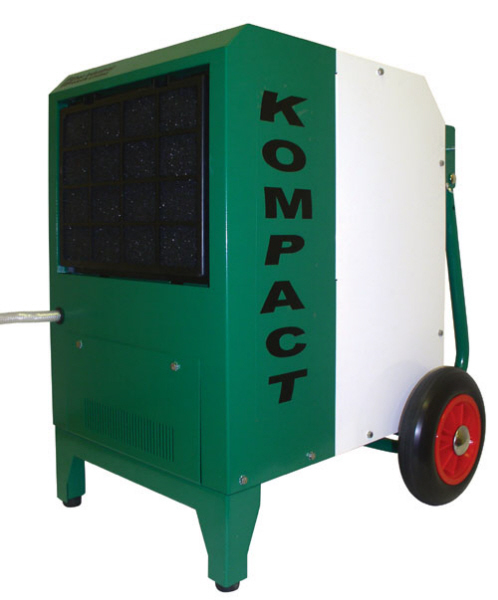 As with all Ebac dehumidifiers the Kompact has a tough stoved epoxy powder finish maintaining a high visual appearance even in the most demanding of environments. An essential feature of the Ebac Kompact, which is a must where insurance work is concerned is the hour meter fitted as standard on all Kompacts. Along with a condensate pump and a electronic defrost timer these features ensure high performance acoss a broad range of operating temperatures. An additional benefit is that the condensate pump has a 10 foot maximum pump height which ensures that no installation is too difficult. With the aid of a purge facility all residue water can be drained from the pump integral tank prior to moving the machine therefore eliminating the changes of spillages. With large rear wheels and a carrying handle the Ebac Kompact is easy to manoeuvre on site, the collapsible handles also allowing the machine to be transported in vehicles where space is at a premium. Extraction Rate Approximately 20lts per 24hrs at 30 deg C & /80% RH.